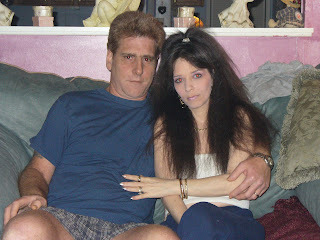 I thought I would put an entry here for those who really don't understand whats wrong with my husband and I .. This way when you read my entries they'll make more sense.. I have been sick since the early 90's. It all started with a severe case of Lyme Disease and it just never stopped.. In the last 5 years, Ive ended up with a complication of not being able to swallow most solid foods. My diet really just consists of scrambles eggs in the morning that is in a white butter sauce too help them go down, in the afternoon I have soups that I make myself with all fresh ingredients for vitamins and nutrients etc and put into a blender ( yeah I know, not so appetizing but when it's all you can get in you learn too like it), I also drink Glucerna drinks which are like those "Boost" drinks but they dont make your blood sugar go wacky. No I dont have diabetes but sugar does make me sick (unknown as too why) and the Glucerna doesn't make me feel so bad as the boost and other vitamin drinks out there do. The other ones also cause major stomach pain.. I have a lot of digestive issues as well. I also live on bite size Hershey Chocolate bars.. not the best thing in the world but it has helped me put on 12 pounds in the last few months which I desperately needed.. I was 83 pds, talk about frightening huh? and now I"m up too 95. My husband Lou, has been dealing with back problems from way back in the late 80s... Since 1997 hes had 5 back surgeries, the last one being a 4 level disc fusion. I wish I could say it helped.. It did in some areas and made others worse.. and then in Oct of 2007 he had a 3 level neck fusion. He has from all this degenerative disc disease and sadly it seems like the damage is just working all the way up his spine. He's on heavy pain medications. Currently he's on Fentanyl patches, along with Morphine pills every 4 hours, Valium as needed for spasms and prescription ibuprophen and all of that doesn't even take the pain away totally , it makes it "tolerable".. We are set too see a pain management doctor next week for him and discuss a nerve stimulator implant for his back.